Hello, friends! 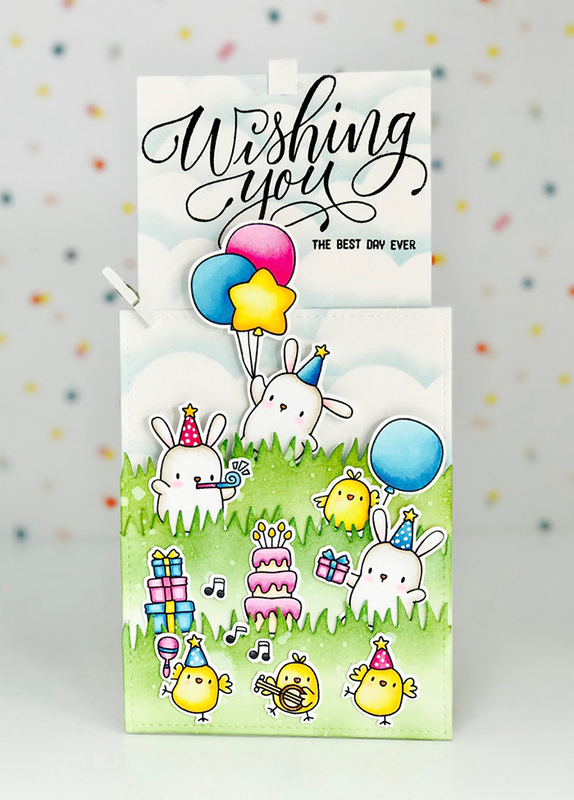 Amy here today with a hidden pull tab slider Birthday card for the Designer Series. 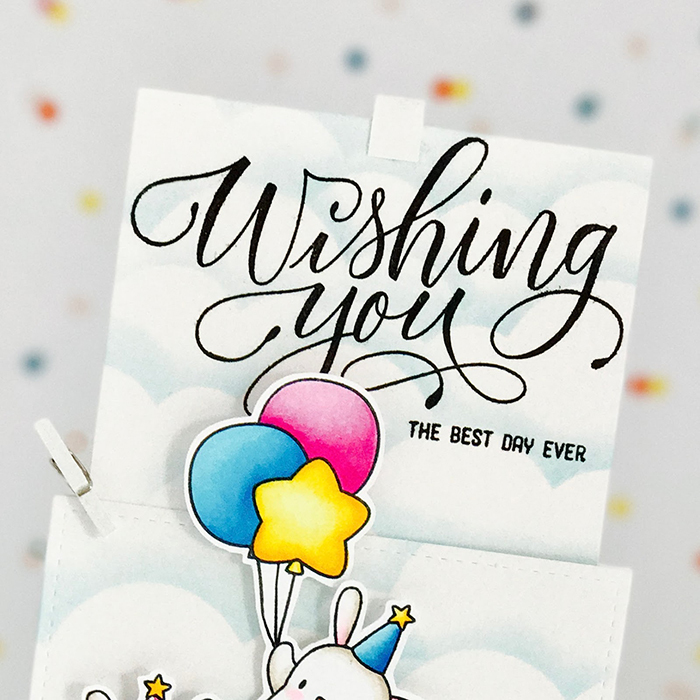 My card features the new and beautifully hand lettered Wishing You stamp set and super cute Party Animals stamp set. I have a lot to explain, so let's get started! To create the main panel, I die-cut Bristol cardstock using the rectangle die from the Peek A Frame creative cuts. I love this die; it cuts perfect A2 sized rectangles with stitched detailing. Then, I die-cut acetate using a cloud die from the Landscape Trio. I used that as a stencil to create puffy clouds, along with Tumbled Glass Distress Ink (see photo 1). Next, I used my paper trimmer to create a thin channel for the hidden bunny to slide up and down. We'll talk more about this a little later. Then, I turned the the front panel over and laid the slider paper in the center. I added thin strips of dimensional adhesive to both ends. This serves as a house for the slider (see photo 3). I also attached a small tab to the top (hinting that there is a interactive element to this card). With the slider is lined up behind the front panel, I added a small rectangle shaped piece of dimensional foam and adhered the bunny on top. The foam attaches to the hidden slider and the bunny (see photo 4). Doing so will ensure that when you pull the tab up, you will get the sentiment along with the hidden bunny. Since everything was set in its place, I adhered the front panel to a top folded card base. 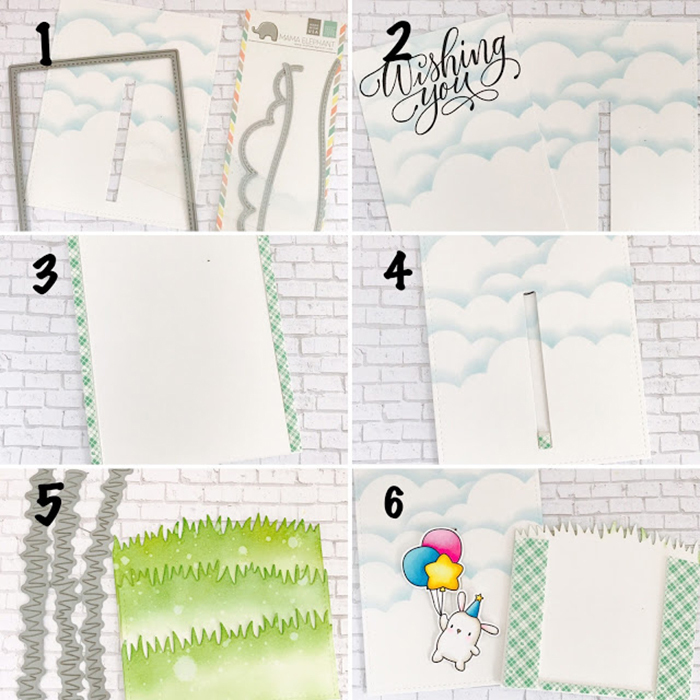 To create the grass panels, I die-cut Bristol cardstock with Peek A Frame and then die cut them with Grassy Trio Creative Cuts (see picture 5). I made sure the tallest grass panel was about the same height as the channel containing the bunny. As a result of the hidden channel, the card has a cleaner look. I distressed all three grass cuts with Twisted Citron and Mowed Lawn Distress Inks, and added splatters of water with my fingers. I then blotted the grass dry with a paper towel. Once I adhered all the grasses together, I added dimensional foam adhesive to the back just around the outer edges (this allows you to freely slide the bunny up and down) and attached it to the main panel (see picture 6). 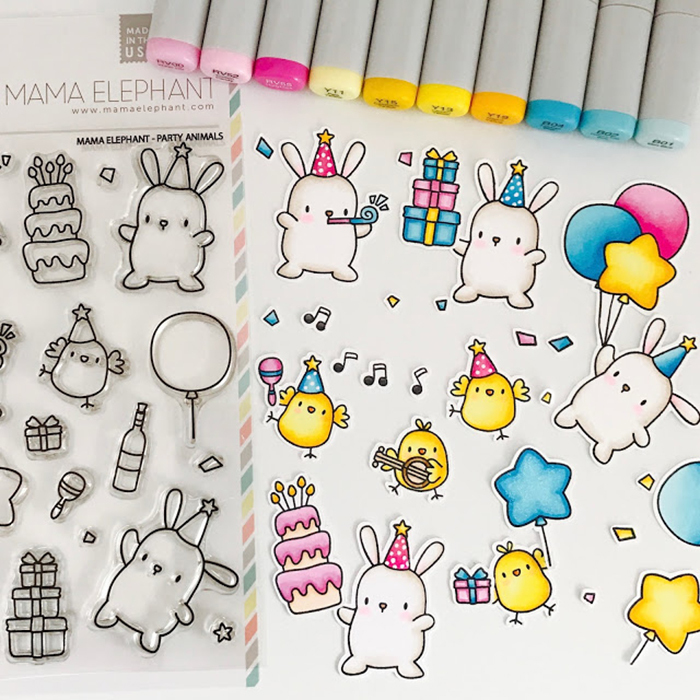 I stamped a bunch of images from the Party Animals stamp set on smooth white cardstock and colored them with Copics, cutting them out afterwards. I adhered them to the grass, creating a fun party scene. This completes the card. I really hope you like my project and I have inspired you to try making your own hidden pull slider card. Love love love love love... Did I mention I love it! So Adorable ,cute n fun ! OMG! I love it! Tons of CUTENESS!! Oh my this card is just tooooo cute. I love the look of those precious critters. 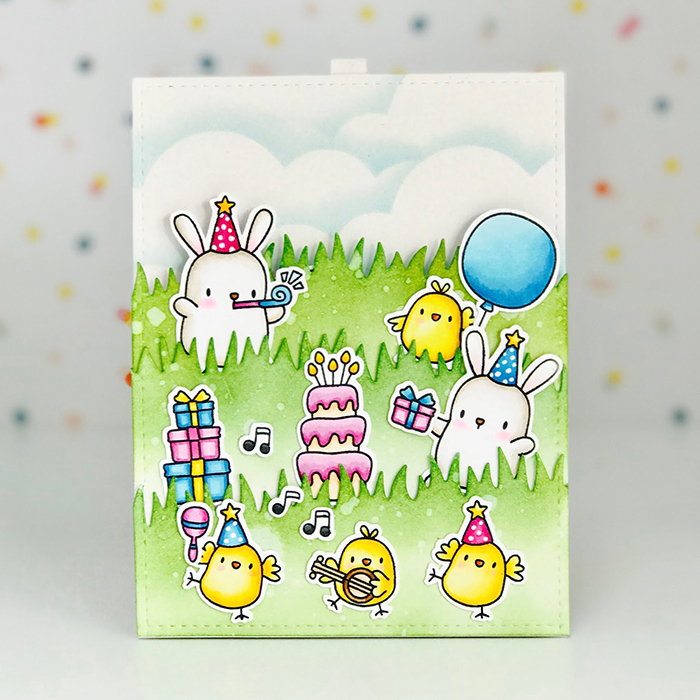 What a happy birthday card and those grassy hills are awesome. I need this set. Wow, super cute interactive card. This is so cool - any chance you could make a video of it? This card is too cute!!! I LOVE everything about it!! Fabulous design! Absolutely adorable! What a wonderful design full of cute critters! Thanks for sharing!